Stainless steel sinks are easy to clean, durable, resists corrosion. Steel surface has hygiene value (health safety). Stainless steel sinks have resistance toward hot or cold objects and resist damage from impacts. Many Contractors do not include cost of sink inside Cost of Kitchen Platform. It is good idea to clarify the point. 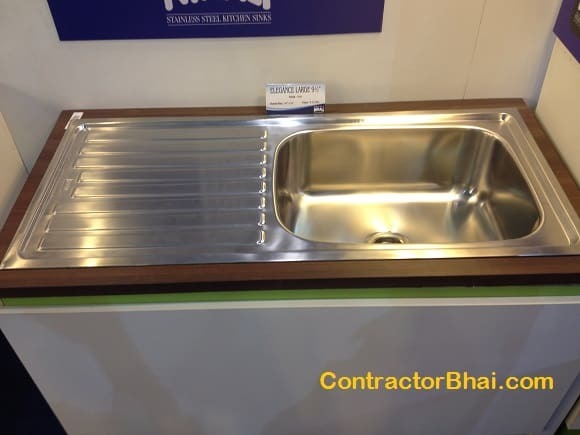 Branded Sinks have almost same price across India. Dealers sometimes are able to give 3%-5% discount on the MRP. Steel used should be high quality from steel authority of India Selam (Selam Steel).